Perfect amount of "closeness" Hydrating None when used correctly Most shavers are a little bit to close for me. The schick hydro is just the right amount. The only thing I noticed is if I press down too hard it will leave me with little bumps the day after. Moisturizes your face a lot! Does not irritate at all Cheap cartridges No acne Shave could be a little closer I was very skeptical at first but I have severe acne and I didn't want to try out a blade that I had no idea what it would do to my skin (my mom got it on sale at walgreens). Just after the first try I knew this was something different, I've used all kinds of razors and nothing comes close to this. The shave is very moisturzing and it does not irritate at all. Not a single zit after I shave with these bad boys, otherwise with other razors I would be lucky if I got only one huge zit. Hydro 5 1. Blades have a guard on it so protects your skin against unintended cuts 2. Glides extremely smoothly along face, almost feels like it's not doing anything, but it is. 3. Cheaper refills than Gillette 4. Cool retractable head to reveal trimmer functionality. 1. I found the shave not as close as my Mach 3 2. Because razor head is bulky, could be tricky to dodge around acne. You can retract head to use precision trimmer, but still not very precise. 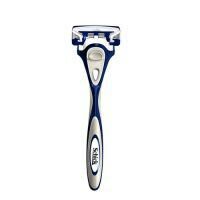 Cheaper alternative to Gillette. Glides smoother, but less close shave. I bought it when it was on special offer. Came with 2 blades. Gel Reservoir lasts much longer than lubricated strips. Blades are more spaced out. Lubricates the face. Non-Irritating. Gives a very close shave. Cartridges are cheaper than Gillette. None. I've had this razor since it first came out about two years ago. To me, this is the best razor out there. I have very sensitive skin, and I've tried many different razors available (DE, Gillette Fusion ProGlide, Disposable, etc). The Hydro 5 is the only razor that does not irritate my face. It offers and close and comfortable shave, lubricates while it glides over the skin, and the gel reservoir seems to last forever. Overall, I highly recommend this razor!